trends we love: white + pattern! — Pencil & Paper Co.
trends we love: white + pattern! With 2018 already in full swing, we're tackling a record number of bathroom and kitchen renovations this year! It's been so fun to see all of these different spaces come together. We've recently partnered with Kohler to share some of the top trends we're currently loving. We're sure it's no surprise that our favorites are white (always a classic! ), and pattern – a Pencil & Paper Co. staple. Helping our clients to create both beautiful and functional spaces that stand the test of time is always our top priority! Follow along below as we share trend inspiration and tips for how to pull it off! Let's talk about why we're drawn to white spaces. A white space is both modern and timeless. It lets the eye rest, calms the mind and provides the perfect canvas to add color and texture. This white kitchen is dressed up with oversized brass pendants and hardware. Another perk of a white kitchen? Fresh blooms truly make a statement! 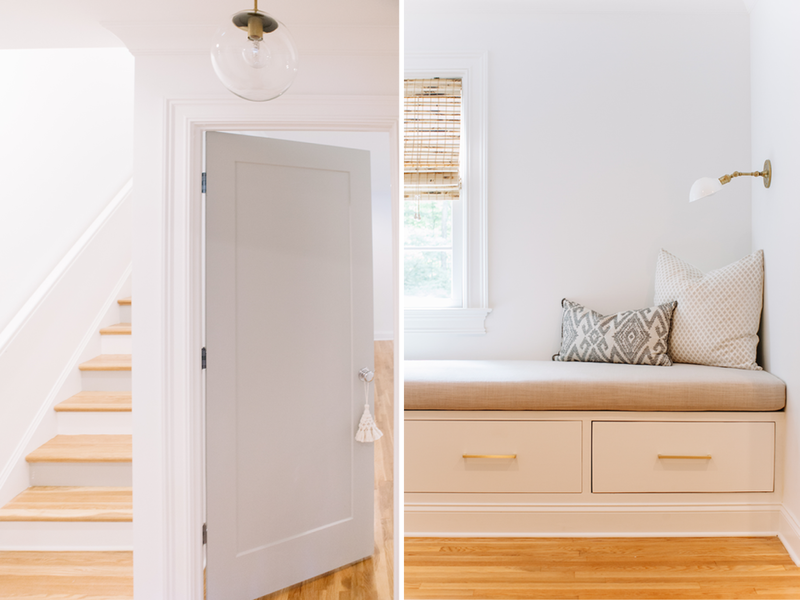 Take a peek above at how we used white throughout a whole home to create a calm and timeless space. We can't wait to serve breakfast each morning in our bright happy kitchen! In a white space, we love adding warmth. The Purist faucet in brushed gold makes the perfect modern statement! 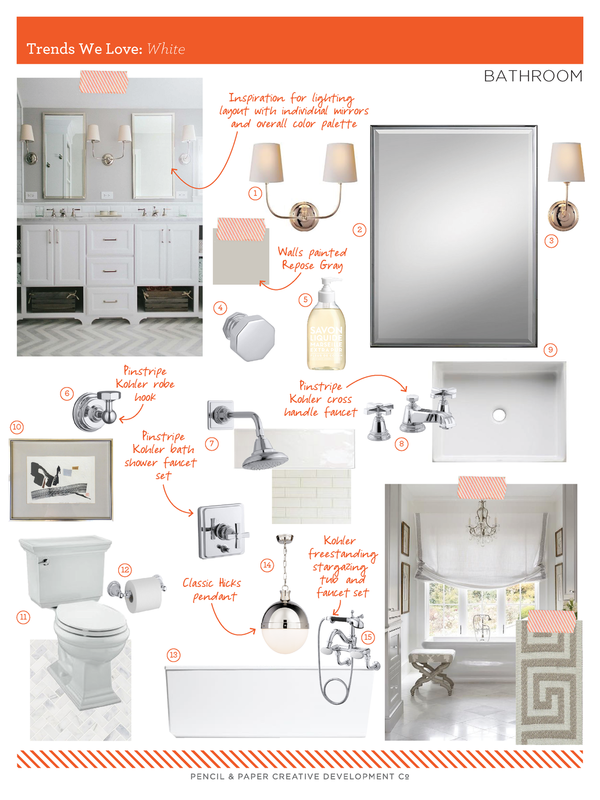 If you love a bright and classic white space as much as we do – then check out below where we've rounded up product from decor to fixtures and faucets to help you "get the look" in your own bathroom! 01. / 02. / 03. / 04. / 05. / 06. / 07. / 08. / 09. / 10. / 11. / 12. / 13. / 14. / 15. It should come as no surprise that we love a healthy dose of pattern-play! We enjoy incorporating pattern into our designs for so many reasons – it adds a graphic punch, can help tie together your overall color palette and adds personality to your space! We're also big fans of mixing patterns - whether it be florals and geometrics or a variety of scales, in our minds, you just can't go wrong with unexpected combos! We love statement making fabric! It adds the perfect amount of graphic interest and personality. From wallpaper to rugs – pattern can be incorporated in a variety of ways! Still not ready to commit to color? Pattern can be found in statement-making neutrals, too! Take a peek below to "get the look" for a colorful kitchen in your own home! 01. / 02. / 03. / 04. / 05. / 06. / 07. / 08. / 09. / 10. / 11. / 12. / 13. All images above via Leslee Mitchell Photography. Thank you to Kohler Co. for sponsoring this post.